It's 04:49 in Senneset, Norway right now. Traffic E39 (Aarbergsdalen) A view of the current traffic situation. Vassenden: Traffic E39 (Vassenden), 17.7 miles away. Svarthomle: Traffic R5 (Svarthumle), 20.5 miles away. Balestrand: Sognefjord, 23.9 miles away. 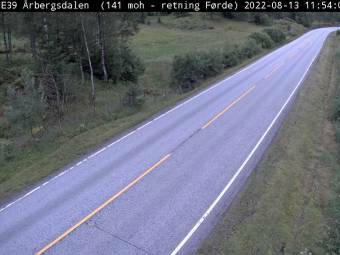 Matre: Traffic F381 (Stordalen), 30 miles away. Bøyum: Traffic R5 (Bøyadalen), 32.6 miles away. Klauvene: Traffic F614 (Grytadalen), 32.7 miles away. MS Finnmarken: View from Bord, 35.7 miles away. MS Finnmarken: View from Onboard, 35.7 miles away.